One of the most important aspects of tourism is accommodation: lodging for guests and visitors from abroad. A century ago, however, there was none of that on Aruba. For the few people who visited the island in the nineteenth- or in the beginning of the twentieth century, there was no place to stay. No hotel, no guesthouse, nothing. Should a government official visit Aruba, like the governor of Curaçao, who came here once in a while, the ‘gezaghebber’ (Lt. Governor) used to supply hospitality at his private home. In 1920, things changed. With the blessing of governor Helfrich, doctor Horacio Oduber’s house was bought by gezaghebber Quast and was remodeled as a so-called. pasanggrahan (a word from Malay - the language of Indonesia -, meaning guesthouse). This house was located at the beginning of the Wilhelminastraat next to the small Protestant church and dated back to 1848. 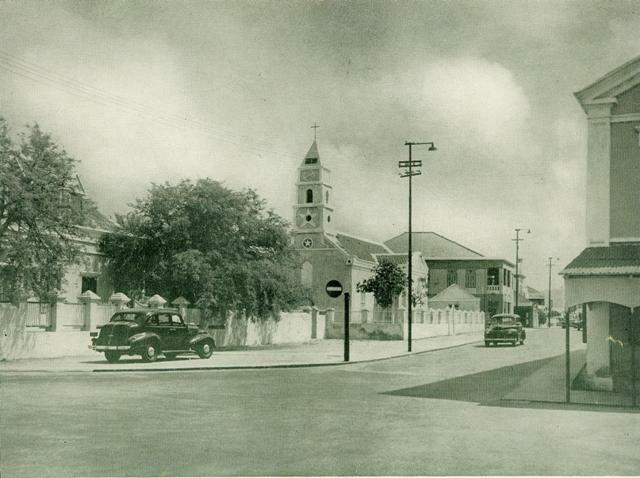 It was pulled down in 1949 and in its place came the new, large Protestant church, still in use nowadays. Doctor Oduber’s house bacame a ‘pasanggrahan’ for government civil servants and other guests. Actually, there was not much luxury: no housekeeping or service and guests had to fend for themselves. At the visit of the Colonial Council in 1930, the bed of one of the Council members even collapsed. So it was not surprising that the governor still preferred to stay at the gezaghebber’s mansion when visiting Aruba, like he had always done before. 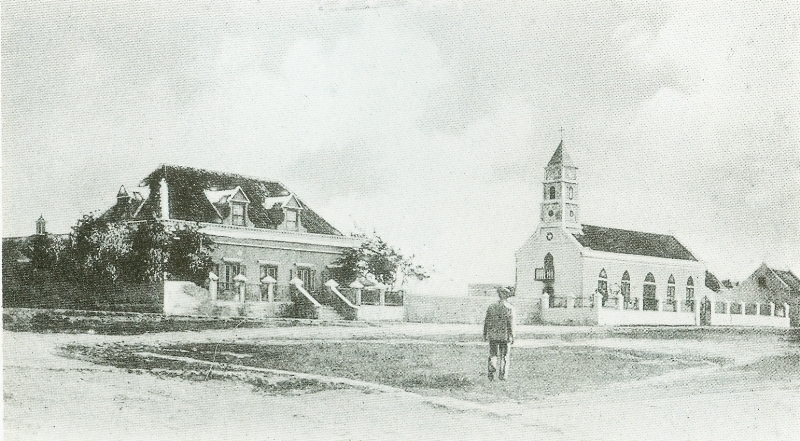 Around 1924, Aruba's first guesthouse was opened, the ‘Pension Aruba’. The building was just across from Fort Zoutman and the Willem III-tower and at that time it had a splendid sea view. With its pillars and balcony, it was easily the most beautiful building in Oranjestad. Next to it was the first cinema of Aruba, the open air De Veer theatre. Pension Aruba became Hotel Colombia later on. Through the years, the building has been used - among other things - as a printing office (Excelsior) and as delicatessen (The Wine Cellar); it is now part of the restored Town Hall complex. 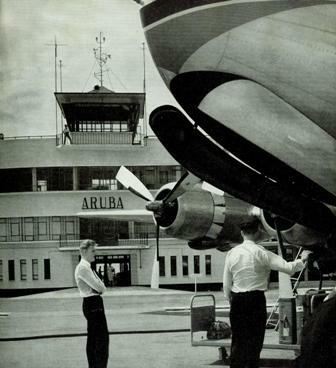 In the thirties the air lift between Aruba and other destinations opened up with the construction of a runway in 1935. For that purpose, a piece of land was chosen at the government aloe plantation Dakota. 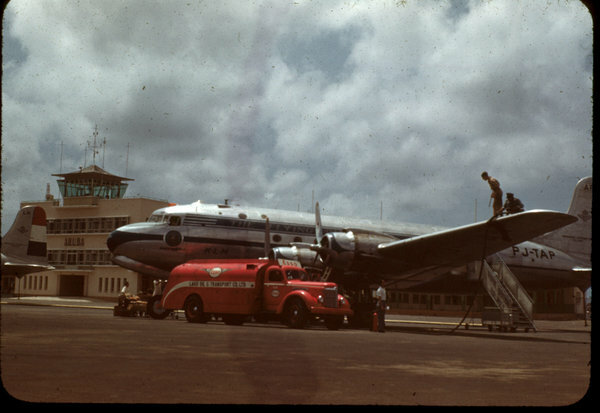 On January 10, 1935 the ‘Snip’, a KLM aircraft, landed at the Dakota airport and the air lift between Aruba and Curaçao became a fact. At the time, the Dakota airport had a wooden shack as its airport terminal. 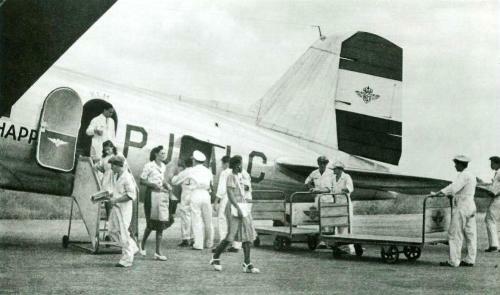 One of the crew members of the first aircraft that landed on Aruba stayed on the island and founded the first real hotel of the island, the Hotel Caribe in the Nassaustraat. This building, later part of the Spritzer and Fuhrman jewelry store, was an old Aruban house, already rickety and dilapidated, with wooden balconies and with a wooden shed in the garden which guests had to use as a bathroom.. The first actual seaside tourist hotel of Aruba was the Coral Strand Hotel, located just outside Oranjestad, on the road to the airport. It was opened in December 1943 by business man Ch. Neme. It still exists under the name of `Talk of the Town Hotel’. The second tourist hotel was Hotel Scala in downtown Oranjestad, opened in March 1949 by J. van Gijn. 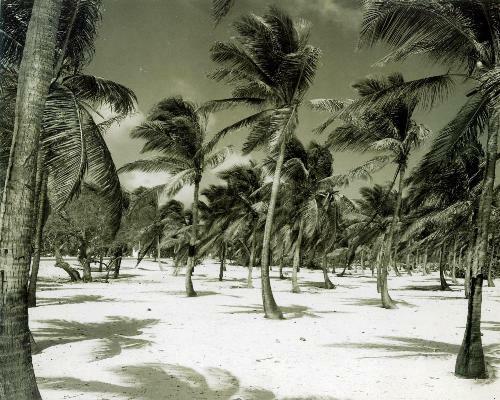 In January 1947 the first tourism office was founded, the ‘Aruba Tourist Commission’ (ATC). Some undertaking business men and government officials who were aware of the importance of the development of tourism took this initiative. A large number of Lago employees had lost their jobs after the war because of computerization of the refinery; other sources of income and more jobs had to be created and developed to broaden the economic basis of the island. 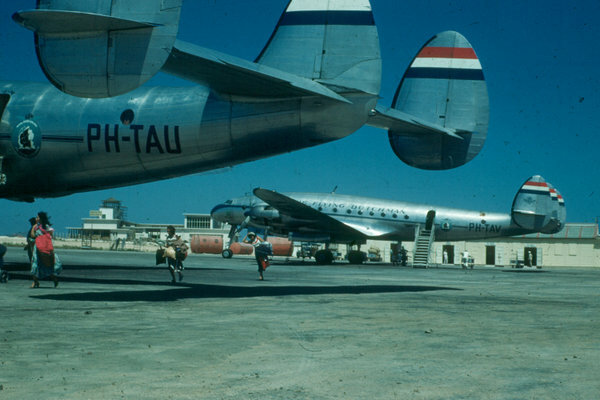 The founders of the ATC may be considered the pioneers of our current tourism. 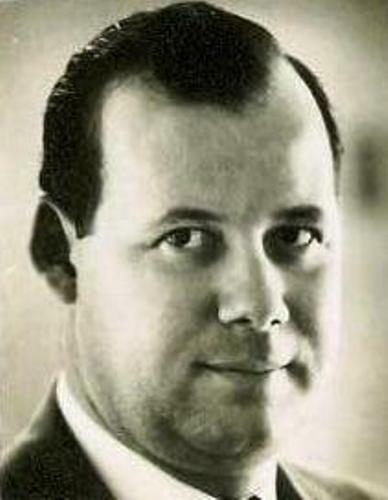 The first director was Ernst Bartels. 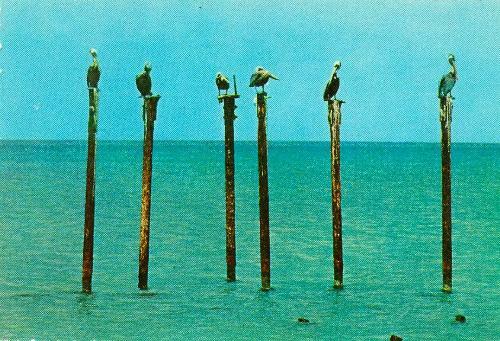 In 1950, the first crop of his work could be harvested: a record number of 980 tourists visited Aruba. 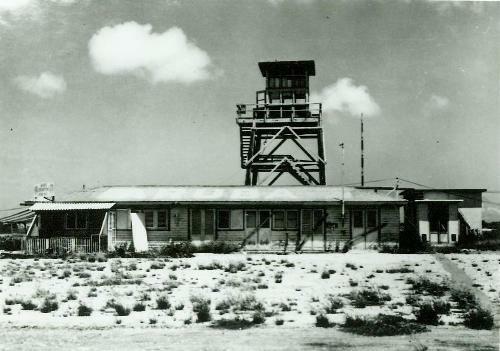 In 1953, the ATC became a government agency and continued its work as the Aruba Tourism Bureau, still headed by Ernst Bartels. 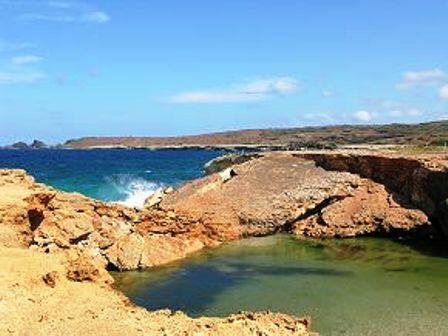 The bureau's primary goal was to promote Aruba as a tourism destination. By that time, total hotel accommodations amounted to just 100 beds: 42 in the Coral Strand Hotel, 22 in Hotel Scala and 36 in Hotel Marchena. 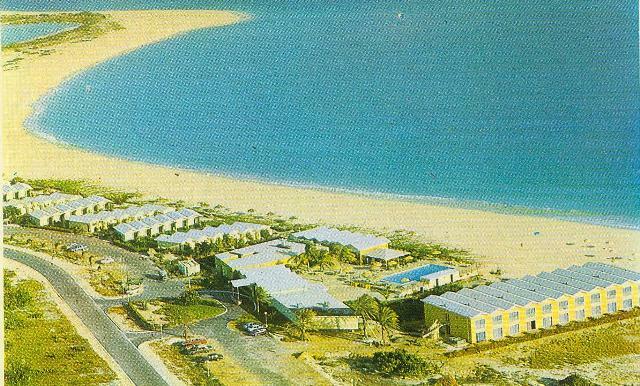 In the fifties the importance of the construction of a beach front tourist hotel was recognized. In early 1953, a contest was held for the best design of a tourist hotel on Palm Beach. The winning concept was the `Basiroeti’ project, submitted by Ernst Bartels and meant to be financed by government funds. This plan was initially rejected as ‘not feasible’ but revived at the end of 1953, when it was endorsed by businessman Neme, who was also the owner of the Coral Strand Hotel. Construction started a year later, in December 1954. It would take years for this project to be completed. Meanwhile tourism took off slowly but certainly. In 1954, the tourist office organized its first promotional campaign abroad. Flyers were distributed among the travel agencies in New York and at KLM, the Royal Dutch Airline. However, some problems had arisen: there were not enough taxis on the island, the helpfulness of the taxi drivers left much to be desired and there were complaints that hotel rates and airline fares were too high. 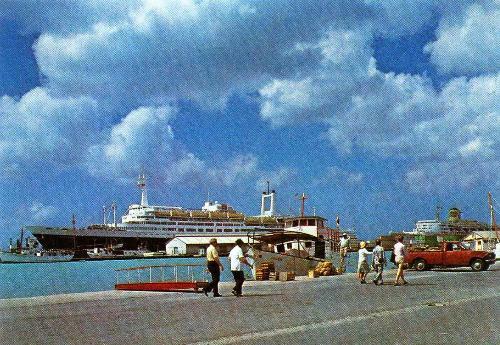 Besides tourists who came to the island by plane, cruise tourists have played an important role in Aruban tourism since the early days. 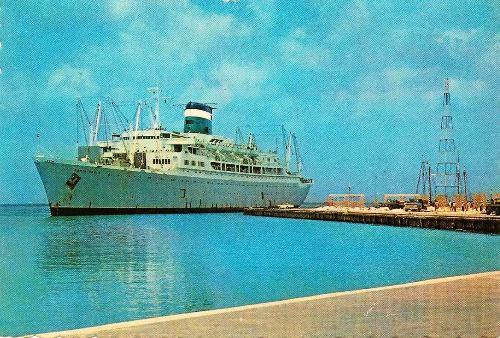 In February 1955 the first cruise ship, the ‘Tradewind’ visited Aruba. An historic event that was duly celebrated. The 300 cruise tourists were welcomed ashore by “Welcomettes”, Aruban girls in especially designed dresses, who guided the tourists through downtown Oranjestad. The whole island gathered around the harbor to gaze att the tourists, which caused a major gridlock. It signified the beginning of a new era in the history of tourism. The visits to Aruba by the ‘Tradewind’ did not last very long; a short while later, the paltry ship was rejected as not seaworthy. But other cruise lines took over quickly, like the Grace Line. 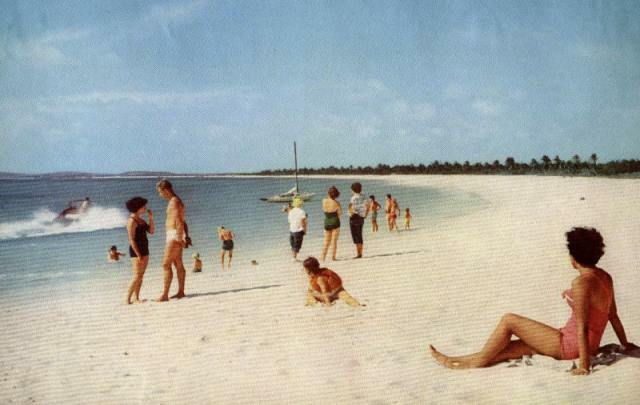 But still Aruba could not respond to the demands that were made to its tourism: in 1956 for instance, some cruise lines demanded a ‘beach development’ before they were willing to add Aruba to their schedule. But the first tourist hotel on Palm Beach was still under construction and it was finished much later than planned. In February 1957, Hotel Basi-Ruti was opened, a hotel with bungalows, spread over the white sand of Palm Beach. 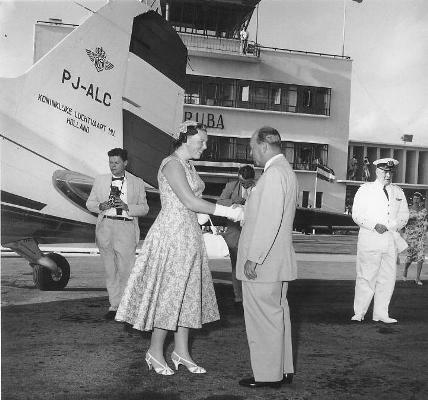 In 1965, Dutch Princess Beatrix stayed there during her visit to Aruba. 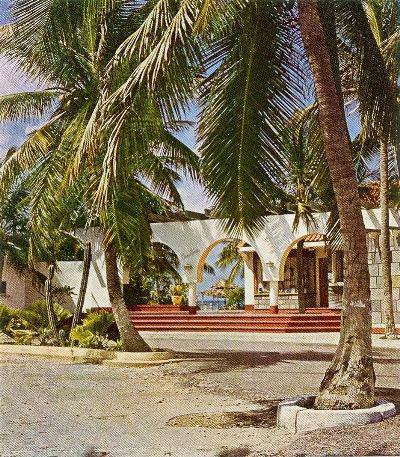 In the meantime, in 1956, the island government had approved the plans for the building of a luxury tourist hotel on Palm Beach, which was to be named Aruba Caribbean Hotel. Designs of the building were approved and ground samples taken. Juan Enrique Irausquin en Oscar Henriquez wrote a report on the construction of this hotel. To gather information, they traveled to Miami and Puerto Rico, both way ahead of Aruba regarding tourism. One of their conclusions was that the beaches there could not compete with those of Aruba, a promotional tool that Aruba needed to take advantage of. But to be able to compete with those established tourism destinations and in order to attract the ‘better’ clients, Aruba had to build a luxury resort. Especially Juancho Irausquin, a politician from the ruling PPA party, is looked upon as the big promoter of this pioneer project of Aruban tourism. For financing and management of the hotel, a corporation was founded: N.V. Aruven; the island was its the largest shareholder. 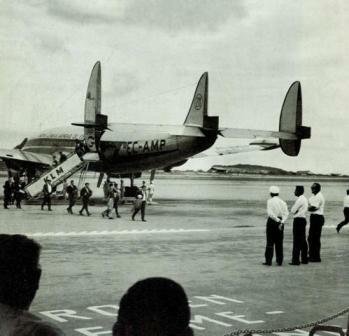 In the course of the fifties, there was a growing interest for the Caribbean from tourists from the United States. In 1957 a government report stated that the Caribbean was the favorite destination amongst Americans. This was partially due to the hype around calypso music in general and singer Harry Belafonte in particular. Furthermore, duty-free shopping in Aruba was very much in demand. In the meantime, promotion of the island of Aruba as a tourism destination also continued and was expanded. A new tool in 1956 was the use of promotion films, one made for the KLM and another one for the Venezuela market. There, the film was shown as a news item in all important cinemas. Tourism from that country was booming and brought many shopping tourists to the island, much to the delight of the retail branch. With the opening of the Basi Ruti Hotel, a start was made to the upgrade of the island’s infrastructure. Up to that moment, Palm Beach could only be reached by secondary roads and that situation was improved by the construction of a boulevard leading from Palm Beach to Oranjestad and the airport. It was opened in May 1958. Other roads were also improved, especially those leading to tourist attractions like Casibari and the Natural Bridge. Traffic signs were placed, supplied by the Dutch Automotive Association ANWB. Oranjestad Main Street was cleaned up; two bars of dubious reputation were ordered to set up shop elsewhere. At the end of 1958, all hotels on the island reached their maximum capacity. There was not a single room vacant on the island. 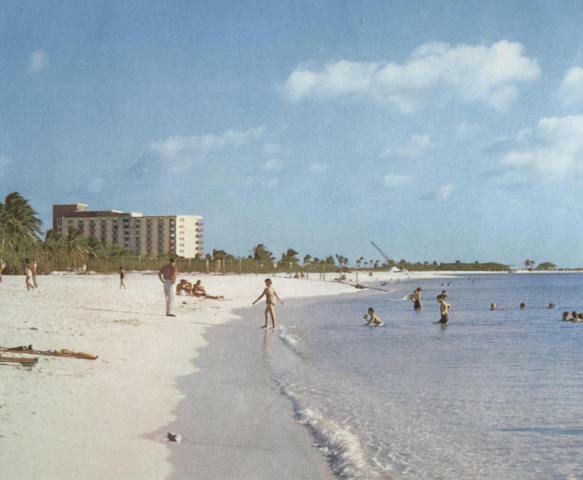 In the summer of 1959 the official opening took place of the Aruba Caribbean Hotel, the first luxury resort of Aruba. With the capacity of 120 rooms, the hotel provided jobs for 160 people, 120 of which were ‘locals’, the rest American managers. 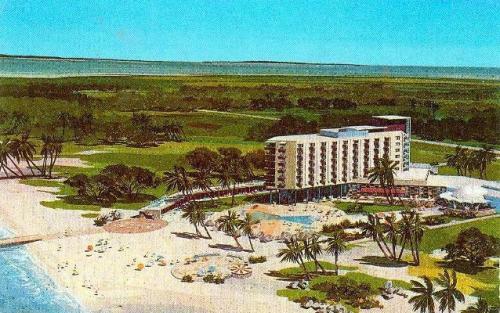 Harry Belafonte was one of the regulars of the ‘Grand Dame’, as the Aruba Caribbean Hotel was also called. In 1959 the first complete pocket guide for tourists was published, in English and in Spanish. It was free and contained information about Aruba’s history, population, climate, tourist sites and much more. 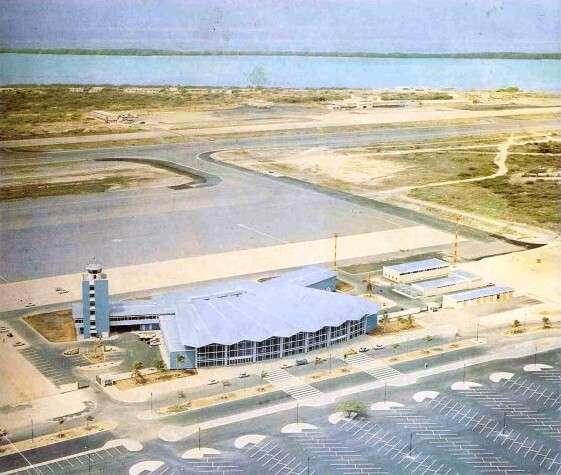 In the sixties, the airport could not keep up with the demands of the times; the era of jet planes had begun and for those a longer air strip was required. 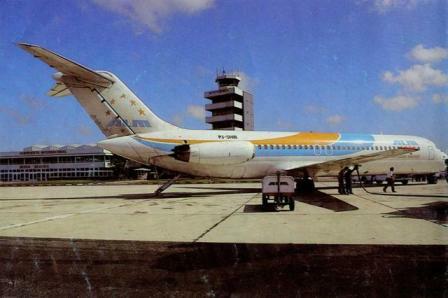 The Dutch airline KLM felt the competition of other airlines in the region that already flew jet aircraft. So the demand of a ‘jet-strip’ had to be met. It was finished in 1964. It was also in 1964 that Aruba got a new hotel: the Cactus Inn, situated in the continuation of the Nassaustraat, opened by businessman Lorenzo Arends. 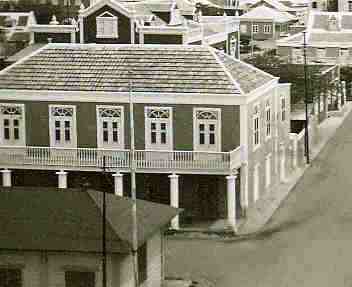 This hotel still exists on the same location under the name of Hotel California in the continuation of Caya Betico Croes. 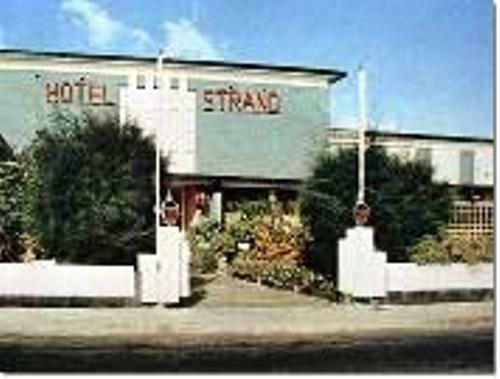 Strand Hotel was totally rebuilt in 1964 and reopened with 82 rooms and a new owmner: Ike Cohen. Even more famous than the hotel it self was the restaurant that had a striking name: ‘Talk of the Town’. This name was chosen as the new name of the reopened hotel. In the course of the years, ‘tourism related businesses’ mushroomed everywhere. However, many of them went out of business or reappeared under another name. One of the best known ‘tour-operators’, De Palm Tours, can not be left unmentioned. 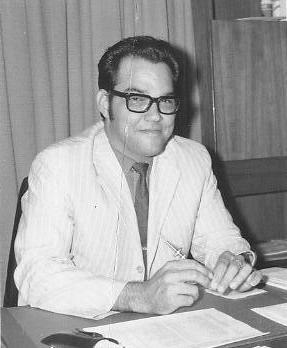 In the sixties, Harold Malmberg purchased a bus company from Witchie de Palm and developed the family business to become the biggest tour-operator of Aruba. It now includes busses, boats, jeep-tours and even its own ‘beach-property’, the Palm Island on the reef across from WEB at Balashi. In the search for original tourist attractions, a Dutch windmill was found in Groningen, purchased, meticulously taken apart and shipped to Aruba. 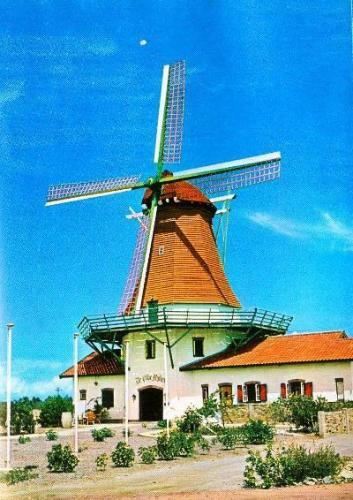 There it was reassembled again and in March of 1962, the restaurant ‘De Olde Molen’ (The Old Mill) was opened. The restaurant went through several ups and downs but Aruba had acquired a striking ‘landmark’! Another popular tourist attraction in those years was the ‘Arowak Miniature Golf Course' that was opened in 1965 on the boulevard in Palm Beach. 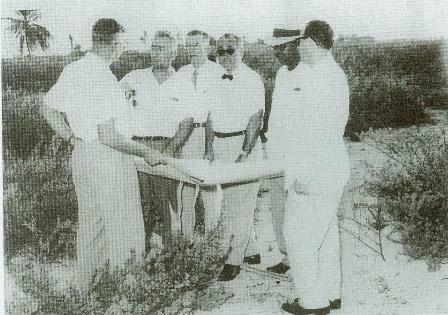 In 1967 a start was made to establishing a zoo in Aruba. Initially it seemed to be successful but in the long run it turned out not to be profitable. In 1969, the zoo and the animals were sold again. Until the end of the seventies, restaurant life for tourists mainly took place in the dining rooms of the big hotels. Artists from Las Vegas entertained the guests and jacket and tie for the gentlemen during dinner shows were a must. A good Maitre 'D always had a spare tie and jacket for guests that arrived unexpectedly and were not shy in giving big tips. 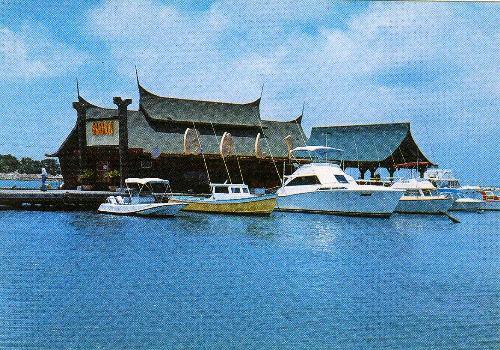 One of the restaurant landmarks was the Floating restaurant Bali in the harbor of Oranjestad. Slowly but surely, the first restaurants outside the hotels started to pop up. First there were the Chinese restaurants like Dragon Phoenix and Kowloon and a popular steakhouse, The Cattle Baron, in the Dakota Shopping Paradise, established towards the end of the seventies. In 1980, the Bucanneer Restaurant opened up in Gasparito; its aquaria made it a direct hit. More luxurious restaurants opened up, amongst which Papiamento in Noord and Chez Mathilde down town. A true restaurant boom followed after the closing down of Lago and the ambiance also became more and more informal: nowadays it is not unusual for restaurant guests to appear in shorts and tennis shoes when visiting a luxury restaurant. The early kind of entertainment was also centered around the big hotels, where international and local bands filled up the dance floor. With the exception of a few discotheques at Manchebo and Talk of the Town, Aruba has never known a real disco craze like it was the case - and still is- in Cancun and Acapulco. Sizzling spots on Aruba were Scaramouche and Visage. In the mean time, the construction of luxury resorts on Palm Beach continued steadily; in February of 1968, just in time for the guests who came down for carnival, the Sheraton Hotel opened its doors. That meant another 300 jobs. At the neighbors', the Aruba Caribbean Hotel and Basi Ruti, the increasing demand for accommodation was met by expanding the number of rooms. At the Caribbean Hotel a completely new ‘wing’ was added. 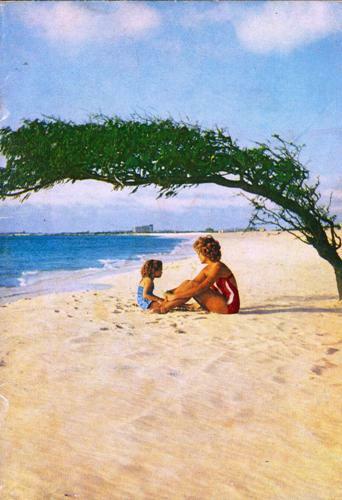 Other beaches too were nice locations for hotels; like the beach at Punta Brabo, where ALM pilots Mensé en Hamminga made plans to develop hotels: Divi-Divi en Manchebo Beach. 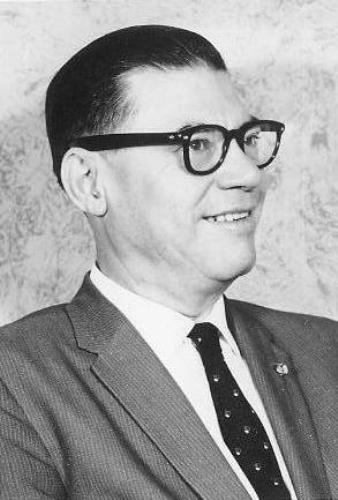 The latter opened up in December of 1966, Divi-Divi in September of 1969. In October of 1969, Nassaustraat got a new hotel: Hotel Victoria with 30 rooms. Owner was François Croes. The construction at Palm Beach continued too. 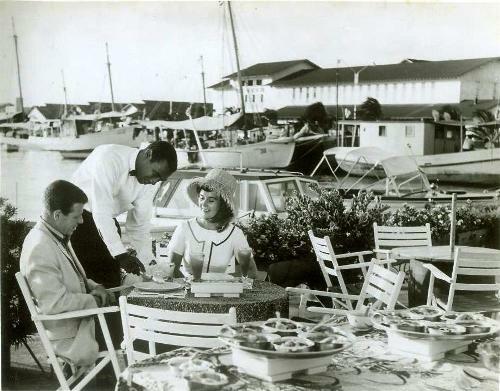 In October of 1969, Holiday Inn was opened, at the spot were the club building of the Police Social Club POVA had been located. They moved to Eagle Beach. Next hotel on Palm Beach was the Americana, a project of American Airlines. It opened up in 1975. 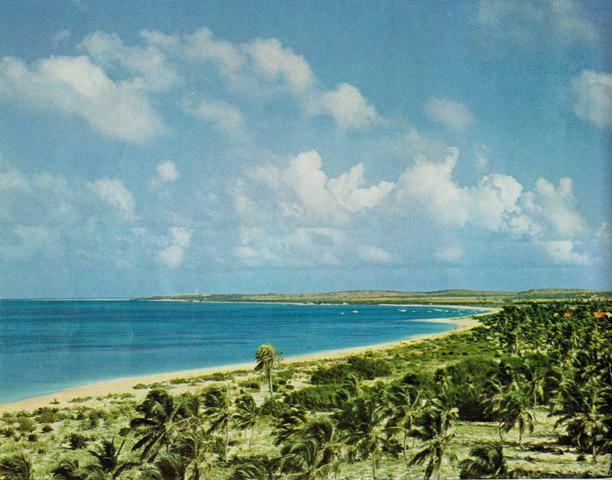 Since 1974, there were plans to build a hotel that would be located south of Punta Brabo, and another one between Divi Divi and Manchebo hotels. 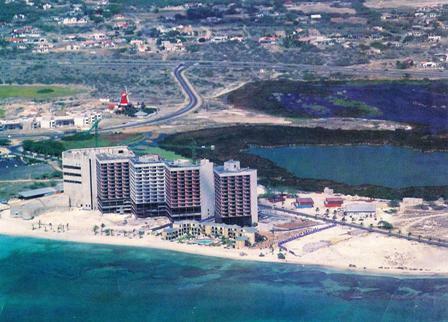 These plans were realized and in December of 1975, Tamarijn Hotel opened up and in 1977, Aruba Beach Club (ABC). Guests to this hotel had to be members of a corporation that owned the hotel. This was how the first co-called ‘timeshare hotel’ on Aruba came to be. Between Aruba Beach Club and Manchebo, Casa del Mar Beach Club was built and opened in 1986. In 1976, construction started of the until then biggest hotel on Palm Beach, that was to arise south of the Sheraton Hotel. It was called Concorde Hotel, opened in 1977. One of the hotels that did not match any longer amidst the relative giants on Palm Beach was Basi Ruti Hotel. It looked rather shabby. Towards the end of 1978, this ‘property’ was sold to the ‘Playa Linda Development Company’. In 1980, this company began the phased construction of the second timeshare hotel on the island: the Playa Linda Resort. Later, the name of the developers was changed to ‘Sun Development Co.’ that built amongst others the ‘Casa del Mar’(1986) and ‘Costa Linda Beach Resort’ (1991) on Eagle Beach. 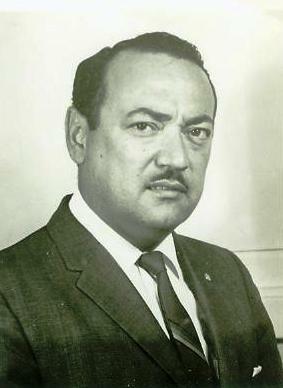 Raymond Maduro who was project developer of Sun Resorts, Aruba Beach Club, Casa del Mar, Playa Linda en Costa Linda and later Tierra del Sol, has played an important role in the development of time share in Aruba. The Aruba Beach Club figures as “exchange resort” #8 on the current list of 6000 resorts, which indicates that Raymond surely had a vision that had worldwide impact. In 1977, a start was made to a provisional Hotel Management School in a part of the former San Pedro Hospital. 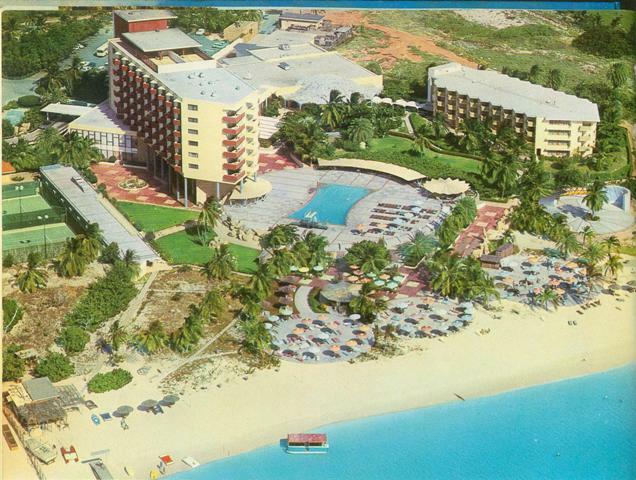 In November of 1979, the Aruba Hotel Business School was opened. It was financed by the European Community Development Fund, which invested 8 million dollars. The school could handle between two and three hundred students. 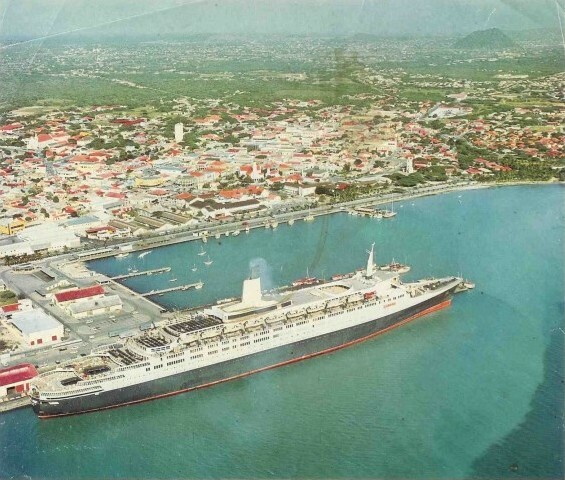 It was part school, part hotel, the Bushiri Beach Resort, next to the container harbor in Oranjestad. Currently, the institute is part of the Enseñansa Profesional Intermedio, the EPI College. 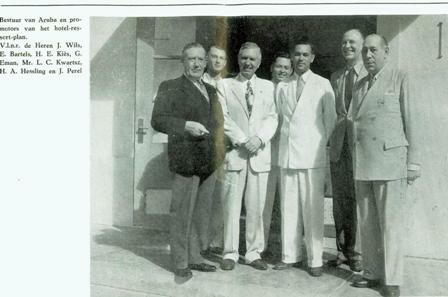 In 1965, a few pioneers of the hotel business on Aruba had joined together and founded the Aruba Hotel Association (AHA). Their goal was to develop the Aruban economy by means of tourism. Founders and first members of the board were amongst others Lorenzo Arends from the Cactus Inn, Ike Cohen from the Strand Hotel and Rory Arends and Michael Kuiperi from the Aruba Tourism Bureau. Initially, only hotels were members of this organization, but towards the end of the seventies other enterprises that were involved with tourism, could join. The name changed then into Aruba Hotel and Tourism Association (AHATA). This organization now represents the private sector in tourism, in close cooperation with the Aruba Tourism Authority (ATA), which is government run. In the course of the years, the following have served as directors of ATA: Michael Kuiperi, Beti Arends, Rory Arends, Remigio Wever (1989 – 1995), Jan van Nes, (1995 – 2000) and Myrna Jansen (since 2000). In the eighties, construction and opening took place of several hotels at different locations: entrepreneurs’ family Mansur built the La Cabana Beach Resort on Eagle Beach, next to which the Dutch family Van Schayk put the Amsterdam Manor Beach Resort. 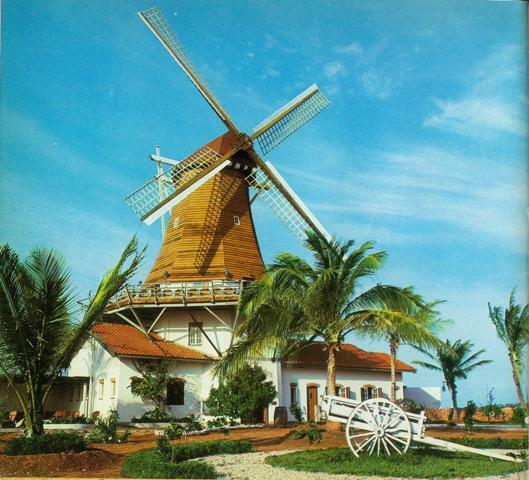 Next to the old mill, The Mill Resort was built and in Noord the Caribbean Palm Village of businessman Johnny Chemaly. On Palm Beach, a rather large terrain between the Americana Hotel and Playa Linda had since long been reserved for a possible candidate to build a resort of the most luxurious class. Finally it came: the Hyatt Regency Aruba Resort, opened in 1990. We must mention that all big resorts featured a casino. In 1983, the Bolivar devalued, which meant a big shock to the retail sector, which had grown accustomed to the “dame dos” (just give me two) from the Venezuelans who bought about everything. Aruba recovered quickly: it went into the Texan market to search for compensation. The eighties were characterized by a sharp decline in oil prices, which caused an enormous devaluation of the Venezuelan bolivar. That meant an almost total stop of the flow of Venezuelan tourists, a big blow to the hotel industry and to the Aruban economy in general. 1986 was a year in which big changes for Aruba took place in different areas: the Status Aparte went into effect for the island, the Lago refinery shut down, which meant that Aruba lost one third of its revenues and unemployment rose to 20 percent at one go. Aruba had to change its tack as to its main economic activities and that had to be tourism: several hotel projects were developed, with varying success. In Oranjestad, a shallow next to the Wilhelminapark was raised and developed by American Bob Swain. The Swain Wharf consisted of a shopping mall and a hotel. Businessman Eduardo de Veer was granted permission to build a hotel next to the premises he owned on the waterfront in down town Oranjestad. 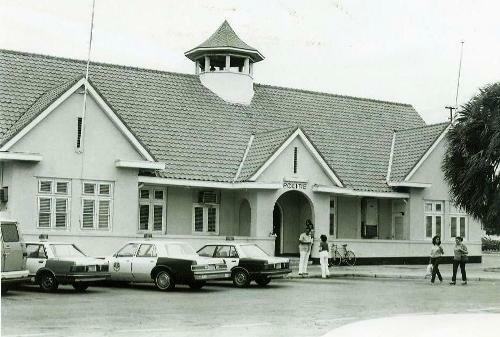 However, that meant that the old police station had to be demolished. The hotel was built by Venezuelan contractors and finally managed by the Sonesta Group. 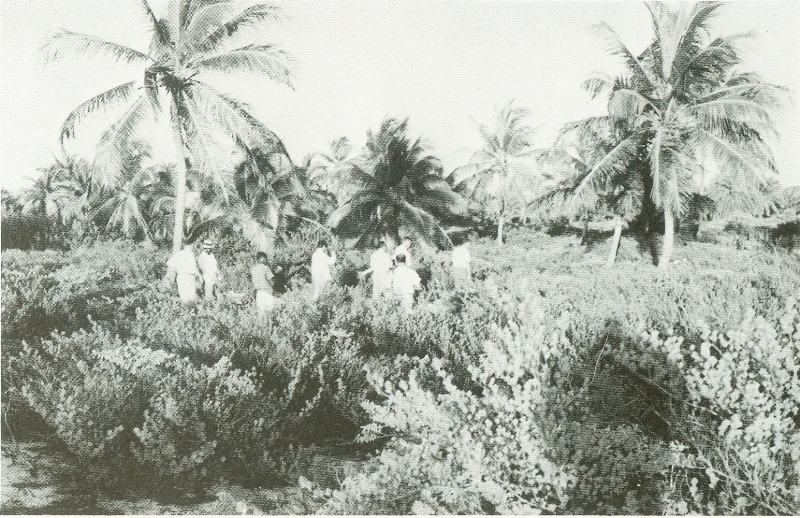 As ‘beach property’, an open spot in the reef, next to the start of the airstrip of the airport was developed: the Sonesta Island connected by shuttle boats to the lobby of the hotel. Some other projects ended in disaster: development and construction were started with government guarantees but mismanagement, unreliable contractors and bankruptcies caused the cease of the completion of some hotels: a hotel south of the Concorde Hotel, that was called Eagle Beach Hotel during construction and was to be named Ramada Renaissance or Aruba Royal Resort after completion, that had not been half completed, had to be torn down partially. The tower that was almost finished was auctioned off and was finally taken over by the Divi Corporation. It is now part of the Divi Aruba Phoenix Resort. There were more serious problems for two hotels under construction north of Holiday Inn, which were to be named Plantation Bay and Beta Hotel respectively. Before construction was completed, they ran out of money, the Italian contractors had left without notice and the unfinished buildings were left empty for years, like modern time ruins. The government was even considering blowing up the skeletons when hotel magnate Marriott took care of them. 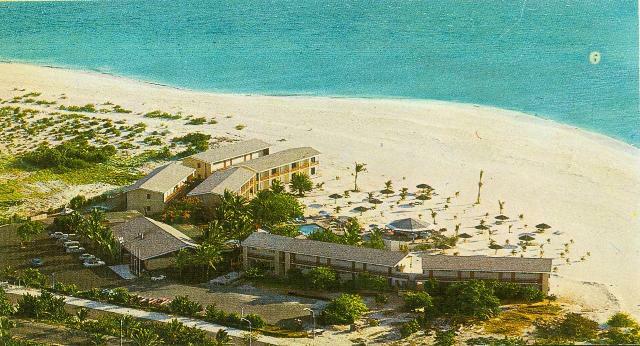 In the course of the nineties, the Marriott Aruba Resort (the former Plantation Bay) was finished, followed by the Marriott Vacation Club (the former Beta Hotel). In 2007, the enormous Marriott Surf Club completed the triptych. That was how one of the darkest pages of the history of tourism in Aruba ended. For the island and for the government of Aruba however, the misery was not over yet. : the companies that had begun developing these and some other never started projects with government guarantees, summoned the country of Aruba and its government in court in the United States and in Italy and won their claims. Tens of millions of dollars were at stake, guaranteed by the government at that time. The government had to comply and the financial obligations that were the consequence of this were an enormous burdon on the state budget, which still causes an increasing deficit on the state balance. Another phenomenon that brought a bad name for the Aruban timeshare industry was the financing through “bonds issues” (emission of shares). Project developers like Swain Wharf and Paradise Villas sold “bonds” against interest percentages of 12 and14%. They guaranteed that that they would pay them back by selling their timeshare project. This worked well for some time and bonds were popular because of their yield. However, things went wrong when Swain Wharf went bankrupt and a lot of people lost their savings. Swain Wharf was taken over by Meta Corporation but the timeshare owners retained their rights, based upon the principle that property sold does not annul the rent agreement. Paradise Villas owners met a similar fate: they had to make extra investments to secure their timeshare. Bonds issues also went sour at Tierra del Sol and La Cabana Villas. At Tierra del Sol owners of bonds lost their investments again when Sun Development went bankrupt and at La Cabana Villas, their dept in bonds was converted into weeks of timeshare. Many hotels have gotten new owners, new management and new names: the Caribbean Hotel became the Golden Tulip Hotel and is now the Radisson Aruba Resort. 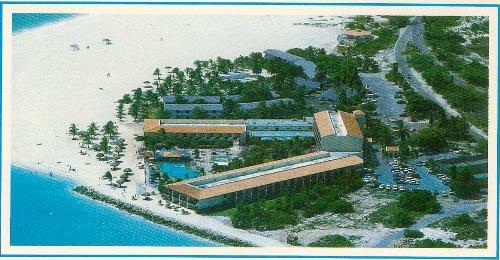 The Concorde Hotel became the Hilton, after that the Wyndham and is now called Westin Aruba Beach Resort. The Swain Resort was taken over by De Veer’s META Corporation and became part of the Sonesta Resort. The Sonesta Resort for its part got a new management company later and is now the Renaissance Aruba Resort. The malls and the reef island that are part of it carry the same name too. The Americana became the Allegro Resort and now operates under the name of Occidental Grand Aruba; the Sheraton was renamed the Aruba Grand before undergoing a true metamorphosis: it is now a part of the prestigious Riu Palace. The tourism boom on Aruba has since many years had an enormous impact on several aspects of society. After the prolific growth of hotel construction in the years after 1986, a construction stop was announced in the hotel sector. But certain kinds of accommodation were not included, like condominiums. Reconstruction of the previously mentioned empty hotels and expansion and renovation of existing complexes were not covered either. Nor was the construction of shopping malls. The consequence was a steadily continuing construction in the tourist sector which caused a flow of temporary labor, mostly illegally living on the island. In the meantime the infrastructure on the island could not keep up with the developments: there were not enough houses, roads, schools and etcetera, for the constant increase in the population. The government is also willing to make an exception to the construction stop when it concerns the construction of a resort in the most luxurious category. The plans to establish a Ritz Carlton Resort north of the Marriott Resorts, at Fishermen’s Huts, were controversial. There was a lot of opposition from the community: it is practically the only free strip of beach for the population and there is a lot of camping there around Easter; wind conditions are ideal there for windsurfers and kite boarders and it is the site for the annual Aruba Hi-Winds; all of that would be seriously threatened by the construction of a hotel. Not to forget the poor tortoises, that use this part of the beach every year to hatch. Environmental organizations held manifestations at the site that brought back memories of the actions against the racetrack (see chapter The Country Aruba). Nothing has been heard any more of the Ritz Carlton construction plans but the government still seems willing to negotiate with other interested hotel chains. The history of tourism in Aruba is a fascinating story: it has accomplished employment for all Arubans, directly or indirectly. It also has drastically modified the appearance of the island: the big flow of American tourists has led to a far-reaching Americanizing of the culture, which can be felt amongst others in the number and types of restaurants (fast-food or otherwise) and in the types of places of entertainment. Aruba is being promoted as a honeymoon destination and students have also found their way to Aruba for spending their spring-break or other vacations, where they go all out. That is liable to go wrong now and then, which Aruba has experienced with the case of Natalee Holloway. This young American vanished without a trace in 2005 after a night on the town. The negative publicity for the island that this story brought about has plunged tourism in Aruba into a considerable recession and years later, the effects are still being felt. 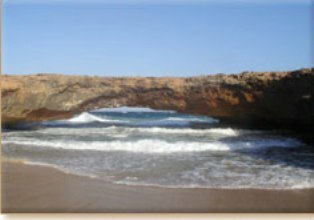 And finally, Aruba lost an attraction of world fame, the Natural Bridge, which collapsed on the 2nd of September, 2005.